Help Dove Celebrate 60 Years of Care! I have always been a huge fan of the Dove brand. Not only for their great products but for their great initiatives where they put real women first. In case you haven't noticed; strong, independent, confident, real women who aren't afraid to be who they are have always been at the heart of the Dove brand. Can you believe that Dove has been caring for skin for 60 years now? They are the brand that pioneered the first-of-its-kind in cleansing technology and put it into the iconic Dove Beauty Bar formula which has remained unchanged since its launch in 1957. How great is that? Obviously, Dove has been a longtime trusted brand. Not just by me, but by millions. Dove has influenced me and my daughter with their inspirational messages of self-worth, self-care and positive body image, all of which are super important. I posed a few questions to my daughter Caci, to see how I shaped her "image" of herself. Me: How did I instill body positivity in you growing up? Caci: You always encouraged me to love myself and to not be so hard on myself when it comes to my appearance. At one point, I fell into the habit of comparing myself to others and in those moments, you often reminded me that everyone is made differently and that I cannot compare other bodies to my own. That piece of advice truly helped me to reshape my thinking of body image. Me: How did I inspire you to reach your personal well-being goals? Caci: You have shown me that being healthy involves more than just making healthy choices for what you put in your body, but it also involves being healthy and happy mentally. You have always told me to stress less about the small stuff; take a deep breath, and do my best. These are words I truly try to live by when it comes to my well-being. Me: How did I help you find your inner beauty? Caci: Growing up, I felt very insecure with a lot of things about myself. In a lot of ways you helped me to overcome those insecurities. You constantly provided me with words of encouragement and you were always the first one to congratulate me or compliment me. Over time, those little reminders ultimately boosted my self-confidence and really have taught me to love myself and my most unique qualities. Me: What’s the most important piece of advice that you learned that you'd pass on to your daughter? Caci: You have given me a lot of great advice throughout my life, but the one piece of advice that I really hope to pass on one day is to not be so hard on yourself and to really love who you are as a person. As simple as it sounds, I believe it speaks volumes in terms of not only accepting yourself but embracing what makes you who you are. Have you seen the new limited edition Dove Beauty Bar specially engraved with the word "care" to celebrate their anniversary? It's a fantastic reminder about what the Dove brand is all about. Rest assured that this bar with the classic Dove formula and ¼ moisturizing cream is the same Dove Beauty Bar that you know and love. The special engraving is a fabulous reminder to love and care for yourself; another great reason to buy from the Dove brand. Beside the Dove Beauty Bar, there are many more products designed with the same amount of care. I often use Dove Deep Moisture Body Wash, Dove Daily Moisture Shampoo and Conditioner and of course, Dove Deodorant, which you've heard me talk about over and over. Dove Deep Moisture Body Wash is an effective body wash that leaves my skin super soft and smooth. This body wash is great for year round and you will notice a difference in your skin after just one use — promise. If your skin is super dry this winter, give it a try and you'll thank me for how fast it works and how deeply moisturizing it is. Dove Daily Moisture Shampoo and Conditioner offers gentle cleansing and conditioning that doesn't strip the hair. It's safe to use every day. This duo leaves my hair silky soft, easy-to-manage and even cuts down on frizz with its moisturizing formula. Dove truly has come a long way in providing us all with quality products as well as instilling confidence in generations of women. Let's help keep the spirit of the brand alive by carrying on its caring tradition, in celebration of its 60th anniversary. 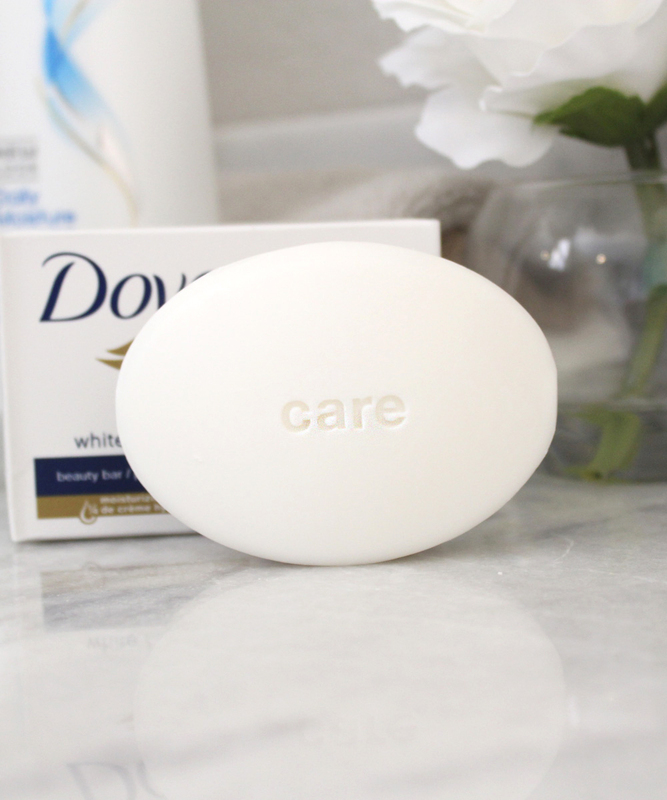 Learn more about Dove's 60 years and the rest of Dove's caring products here. Look for the specially engraved Dove Beauty Bar at Walmart. I found mine in the regular soap aisle, in a six bar pack. Top 10 Foundations for Dry Skin.